Ivan’s session will be part of a specialised workshop with topic „IoT – Developing for the Future”, in which co-participants will be Vesselin Arnaudov, Director Advanced Development Center for IoT at VMware and Hristo Lalev, co-founder of Bulgarian IOTA community. The workshop aims to cover the general development process and phases when building an IoT solution. The entire IoT Adventure Forum 2018 will be an event truly worth attending, with top industry keynote speakers from IOTA, IDC, VMWare, Microsoft, HPE, IndigoVerge, ABB Bulgaria, Bosch, Unimasters Logistics, Navigato, etc. The full day of sessions will include six dedicated tracks, cases studies, workshops and an expo zone, covering the entire Internet of Things ecosystem including smart transportation and cities, developing for the IoT, connected industry, consumer IoT, IoT innovations and technologies and privacy and security. IoT Adventure Forum 2018 will celebrate and recognize the best IoT solutions, projects and companies in five categories. 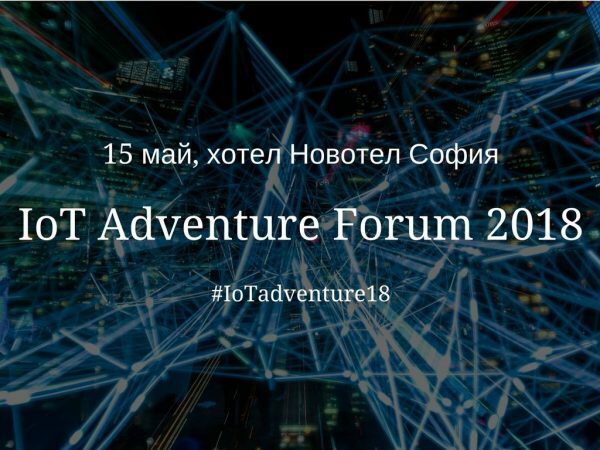 If you want to attend the forum, you can register at: https://iotadventureforum.com/en/register/. Only by May 4th: buy 1 ticket, get 1 free. Use discount code IoTadventure_Promo when registering.